The 13,973lb (6340 kg) JCB 930 RTFL is powered by our highly efficient 74hp (55kW) EcoMAX engine and has a 6,000lb lift capacity. Mast options are 15ft (4.5m) or 22ft (6.7m) so you can tailor your 930 RTFL to the perfect lift height. The 4.4-litre EcoMAX T4 Final-compliant engine in a JCB rough terrain forklift produces peak power (74hp/55kW) and torque (400Nm) at just 1200 rpm for great responsiveness. A fixed geometry turbo further enhances low-rev performance for improved power and tractive effort. 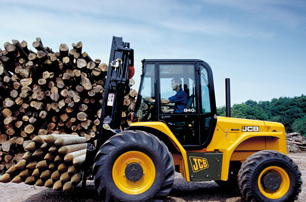 You can fine-tune a JCB Rough terrain forklift to any application and terrain. Lift capacity of the 930 is 6,613lb (3000kg); tires are available in large diameter traction or industrial; long pallet forks in either 3ft (1067mm) or 4ft (1200mm); and either 2WD or 4WD. We offer an optional single or double acting mast auxiliary; in turn, these facilitate a huge range of productivity-boosting options. And, because different applications demand different sizes of mast, you can specify 15ft (4.5m) or 22ft (6.7m) variants. There are two different carriage options on this JCB forklift machines: Class IIIB ITA, or Floating Shaft Carriage. 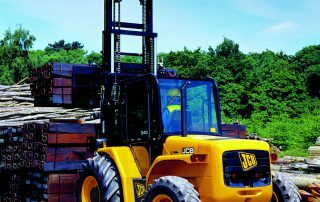 As part of JCB’s Vertical Integration Strategy, we build the engine, transmission, hydraulic rams and cab of every rough terrain forklift so that they’ll work in perfect harmony. The end result is minimum compromise, optimum performance. The left column-mounted powershuttle gives the operator fast and easy directional control, while all-wheel servo braking provides smooth and responsive stopping power. Our new larger high-flow hydraulic pump translates your rough terrain forklift’s power into efficient lifting for increased productivity; cycle times are up to 51% faster. A T4 Final-compliant JCB forklift is a product of our Efficient Design program and, as such, uses up to 11% less fuel than an outgoing Tier 3 74hp (55kW) model. Every 4WD JCB RTFL can be changed to 2WD at the flick of a switch, reducing fuel consumption and tire wear whenever 4WD isn’t required – during roading, for example. The one-piece fully welded chassis on a JCB forklift maximizes strength and minimizes weight, while axles are the same heavy-duty units we fit to our backhoe loaders and Loadalls. 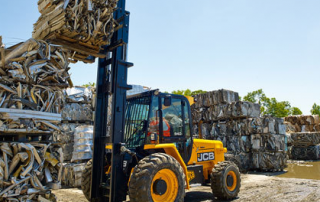 Like every JCB machine, our rough terrain forklifts are put through a stringent testing programme which includes prolonged high stress loading of the chassis, mast and other key components, as well as repeated transmission use over thousands of cycles. JCB engines are tried and trusted. We’ve built 200,000 DIESELMAX engines since 2004, and we’ve tested our new EcoMAX design for 110,000 hours in 70 different machines across the toughest applications and environments. The large, spacious cab of a JCB rough terrain forklift boasts left and right grab handles with wide-opening doors; standard-fit tinted glass which reflects 30% of solar energy; and a new 3-speed heater fan for improved demisting/de-icing of the windscreen. Visibility is excellent, courtesy of direct glazing, fold-back rear doors, a low hood, high cab mounting position, a large roof screen, a slimline outer mast section, and large front and rear windscreens. Optional front and rear work lights provide ultimate visibility. Gas-assisted cylinders make opening the hood on a JCB forklift easy, and the large wide service bay provides good access to both sides of the engine. 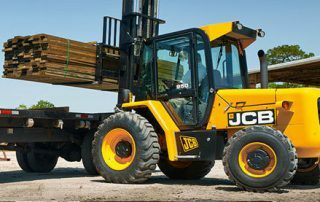 The 16,534lb (7500 kg) JCB 940 RTFL is powered by our highly efficient 74hp (55kW) EcoMAX engine and has a 8,000lb lift capacity. Mast options are 15ft (4.5m) or 22ft (6.7m) so you can tailor your 940 RTFL to the perfect lift height. 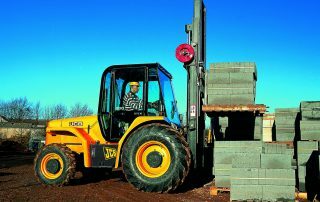 You can fine-tune a JCB Rough terrain forklift to any application and terrain. Lift capacity of the 940 is 8818lb (4000kg); tires are available in large diameter traction or industrial; long pallet forks in either 3ft (1067mm) or 4ft (1200mm); and either 2WD or 4WD. JCB’s new 74hp (55kW) high-torque EcoMAX engine maximizes both productivity and efficiency. What’s more, EcoMAX doesn’t need exhaust after-treatment, so costly heat-resistant lube oils or Diesel Exhaust Fluid (DEF) are unnecessary; in turn, you save on servicing costs. A T4 Final-compliant JCB forklift is a product of our Efficient Design program and, as such, uses up to 11% less fuel than an outgoing Tier 3 74 hp (55kW) model. All cabs on our RTFLs are FOPS (Falling Objects Protection System) certified, ensuring excellent operator protection at all times. For even greater operator protection against falling debris, opt for our front screen guard. 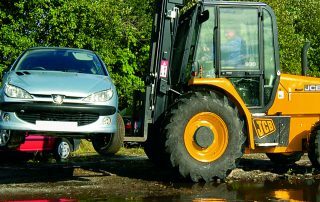 A factory-fit JCB immobiliser can be either key or keypad-activated; it also automatically arms itself after a set period following engine shutdown. This technology not only helps to safeguard your machine, it can significantly reduce your insurance premium too. Gas-assisted cylinders make opening the bonnet on a JCB forklift easy, and the large wide service bay provides good access to both sides of the engine. 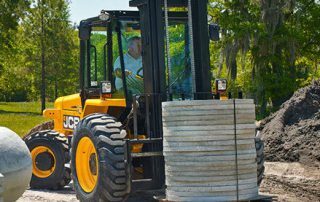 The 17,295lb (7844 kg) JCB 950 RTFL is powered by our highly efficient 74 hp (55kW) EcoMAX engine and has a 10,000lb (4535 kg) lift capacity. Mast options are 15ft (4.5m) or 22ft (6.7m) so you can tailor your 950 RTFL to the perfect lift height. 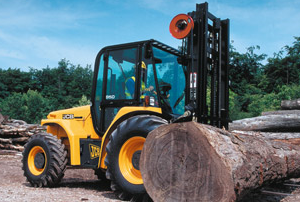 You can fine-tune a JCB Rough terrain forklift to any application and terrain. Lift capacity of the 950 is 10,000lb (4535kg); tires are available in large diameter traction or industrial; long pallet forks in either 3ft (1067mm) or 4ft (1200mm); and either 2WD or 4WD. Visibility is excellent, courtesy of direct glazing, fold-back rear doors, a low bonnet, high cab mounting position, a large roof screen, a slimline outer mast section, and large front and rear windscreens. Optional front and rear work lights provide ultimate visibility.